EXTREMELY STRONG BOW AND ARROW FOR ADULTS. 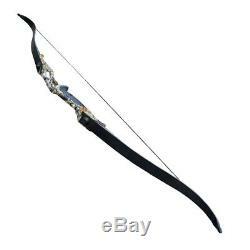 This bow is not heavy but feels very sturdy and solid in your hands, very comfortable to hold and build tolerances are tight. The riser is nice well crafted and solid, made of aluminum; the grip is ergonomically designed and feels comfortable on the hand, even at full draw. Pre-installed brass bushings for many type of upgrade you will ever consider. EASILY ASSEMBLE AND DISASSEMBLE THIS HUNTING RECURVE BOW. It is very easy to take down and put together the bow for storage, transport or backyard competition sport games. When assembled, very small when collapsed, fits in a backpack or hiking pack easily. Please keep in mind that using a stringer tool is the most safe way to properly assemble and disassemble the takedown recurve bow. THE HUNTING RECURVE BOW'S SPEED IS EXCELLENT. 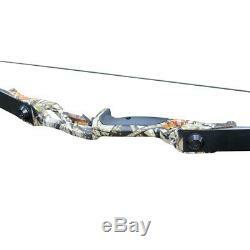 The bow shoots consistently and is very quiet without anything extra on it, the options for multiple limb weights offers flexibility, arrows fly from the bow absolutely blazingly as fast as a compound bow and fly's off very smoothly and quiet, by the way, please don't have doubt in its stopping power capabilities. It is so much fun and very relaxing, you can shoot longer with your friends and family without as much fatigue. 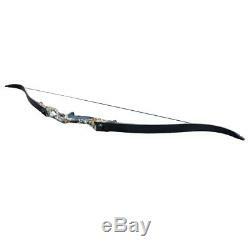 This right handed hunting recurve bow will be held in your left hand, the string pulled with the right hand and determine the arrow with your right eye for a perfect aim. Left handed bows are held in the right hand and pulled with the left hand. 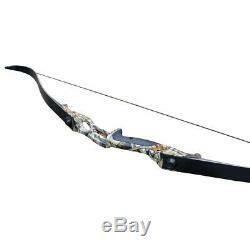 Perfect for outdoor competition hunting traning shooting target practice sport games. 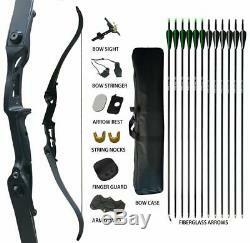 BOW AND ARROW FOR ADULTS KIT INCLUDES: 1 pc Takedown Recurve bow, 6 pcs Replaceable Field Points Fiberglass Arrows, 6 pcs Fixed Filed Tips Fiberglass Arrows, 1 pc Bow Sight, 1 pc Arm Guard, 1 pc Finger Guard, 1 pc Arrow Rest, 1 pc Bowstringer Tool, 2 pcs String Nocks, 1 pc Bow Case. Note: In case hurt yourself and the bow, please do not dry fire the bow, that means, pull the string back and let go of it with no arrow in place. High pound is extremely strong, The arrows from the bow fly absolutely blazingly as fast as compound bow. Draw weight:30lbs, 35lbs, 40lbs, 45lbs, 50lbs. Bow length:57.8'' inches. 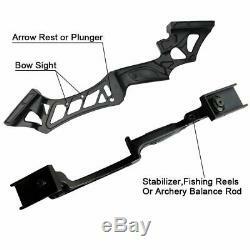 Bow riser material:Aluminum alloy. Fiberglas arrows length:Approx 31'. Fiberglass arrow outer diameter:Approx 7.8 mm. Arrow feather length:3 inch. Size:Approx 31.5''8.6''3.3'. 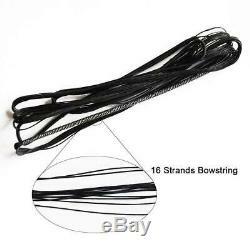 Bow bag material:Nylon archery. Arrow rest:High quality plastic. Arm guard :length:7.5 inch. Width:2.2-4.3 inch. Finger guard width:2.75 inch. This is not a toy, please do not shoot at people. Please do not against concrete wall or any hard substance, like wood rock or brick. This may hurt yourself or damage the arrows. If the fletching have a little bent, you can straighten them by using an air dryer or soaked in hot water (put the vane into 80 Degrees Celsius-90 Degrees Celsius hot water for a few minutes), it can be recover the original shape. We would get the problem resoved and guarantee your benifits. Beijing time 8:30--18:00. We would reply to you immediately. 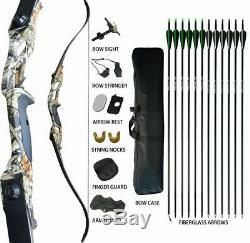 The item "Recurve Bow Set Takedown Archery Hunting Right Handed 54 Arrows Package" is in sale since Thursday, February 28, 2019. 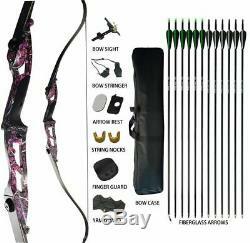 This item is in the category "Sporting Goods\Archery\Bows\Recurve".huntingbowpro" and is located in CN.